The wall thing is a good idea, but I wouldn't want to ruin my wall with all those holes (but that's just me!). I love the ideas of using a frame or something like the last few you showed! Great post! I was just looking to see how I could organize my necklaces and I did! 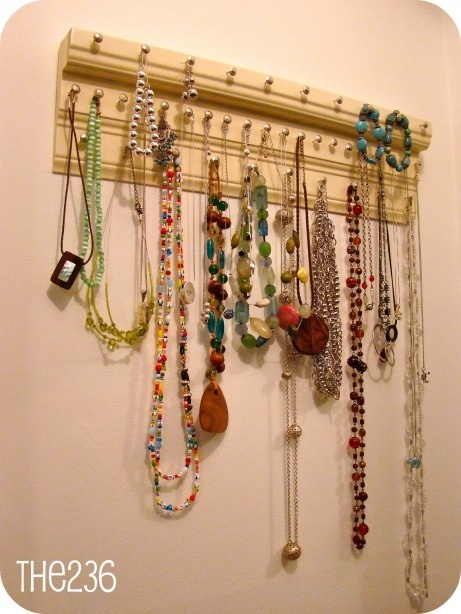 I have a jewelry organizer/dresser, like the one in the 2nd picture. It was the best thing I ever bought. It keeps my jewelry organized and also keeps them from getting dusty. I love the first way picture above- it's so cool to have them all on display like that. Actually, my weekend involves a lot of cleaning and organizing- we're planning to paint our apartment and early spring clean this weekend! I love the version where it's hung in a frame. Most time, jewelry is so pretty that it's a waste to keep it hidden. I have a few pieces on trays in my room, and others hanging on a necklace tree! I really like the framed hanger. Mine are in pretty trays and a jewelry tree, but I'm looking to make something similar for my remaining ones. 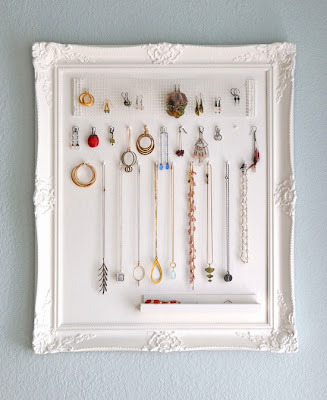 Lauren already commented, but you should check out her jewelry storage post she did a few days ago: http://www.fizzandfrosting.com/2013/02/pretty-jewelry-organization/. She did an amazing job! All my necklaces are really long so I got a neat wall organizer from Urban Outfitters that stores both necklaces and earrings. I can fit a ton on there, and it doesnt take up too much wall space. I love the idea of displaying them inside a picture frame like the photo above. My necklaces hang on hooks on the inside of my closet door. So important to organize jewels. Great ideas! 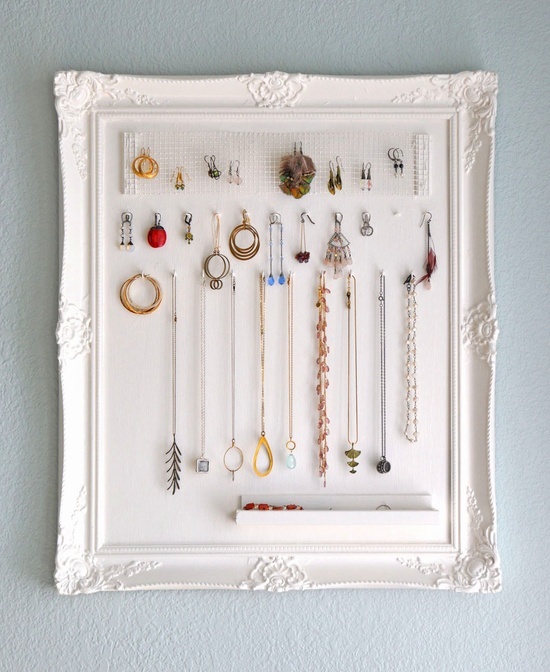 I've been hunting for a great jewelry organizer for awhile, love that white one!